In 2018, and beyond, protecting a positive business reputation is a real challenge. A big worry for many companies is the reputational risk they’re facing from negative press, reviews, social media and more. The Reputation Report 2018 is our latest research into the scale of the problems facing businesses in the UK. Working in today’s highly transparent, fast-paced digital environment, brings many opportunities. But it brings dangers too. Businesses of all kinds and sizes are under increasing threat from poor or unfounded reviews, historic and inaccurate press coverage, or material created and shared maliciously. In an age where all of this can be distributed within seconds, the potential for serious and lasting brand damage – and financial harm – cannot be underestimated. Our latest research, the Reputation Report 2018, looks at the scale of the problems facing businesses in the UK. 1 in 3 businesses (31 per cent) we spoke to told us that negative content had already damaged their business. Another third is worrying about the impact this kind of material will have on their operation and its value in future. And while the threat from reviews and social media posts remains strong, it is in fact negative press coverage that is seen as posing the biggest threat or reputational risk. Almost half – 46 per cent – of companies have been affected or have concerns about press material. More than a quarter (26 per cent) of the businesses say this is their main concern moving forward too. More general critical online content is seen as the number 1 reputational risk for another 14 per cent, while negative social media posts and reviews are still viewed as most damaging by 10 per cent. Reviews are a big cause for concern, with 41 per cent of respondents admitting negative feedback is causing their business the most problems. A further 1 in 3 (31 per cent) feel that negative social media posts pose the greatest threat. The same amount – 31 per cent – are worrying about posts from disgruntled former employees. 25 per cent say that competitors are their main problem. 23 per cent reference content about senior employees. How Much Does A Damaged Reputation Cost? 1 in 20 companies questioned reveals that damaging content has cost them more than a staggering £500,000. Another 5 per cent say they’ve lost between £100,000 and £500,000 because of negativity about their company. 1 in 7 have lost up to £50,000. How Can I Protect My Business From Reputational Risk? The research findings are worrying, but there are ways you can prepare for and counter negative content – protecting your business before damage is done. Taking preventative action is essential, with many businesses making this an early part of their PR, content, social media and marketing planning. Rather than waiting for a crisis to happen, we advise companies make reputation management central to their forward planning. And 95 per cent of the SMEs we spoke to are doing just this. They’re now actively looking to monitor their company’s reputation. It doesn’t have to be expensive, but it does need to be done regularly. Using tools like Google Alerts and keyword searches can give a basic overview. Reputation experts like Igniyte can dig deeper, proactively helping you to protect from risks and build and maintain a positive online reputation. The Igniyte Online Reputation Index, for example, gives our clients an up to date, ‘live’ snapshot of their reputation. It highlights areas for work and recommends tailored solutions. A fifth (21 per cent) of the people we spoke to are already using specialists tools and alerts like these. 17 per cent are enlisting the help of expert agencies like Igniyte – up from 10 per cent in 2014. As our research clearly shows, doing nothing will put reputations at risk. But, being aware of the threats and risks – and planning to mitigate them – will help companies to protect their businesses in 2018 and beyond. 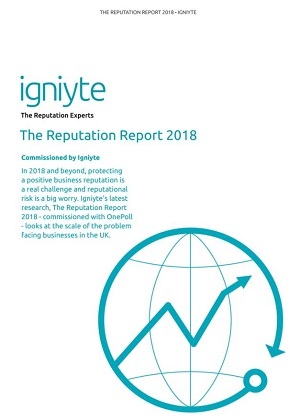 Igniyte's Reputation Report 2018 highlights what's worrying businesses in the UK, the reputational risk, scale of the problems and the cost.